In 1976, Concord Industries started out of a garage with a couple of hundred cases of tape imported from Taiwan. From our first warehouse location in South San Francisco, we have since expanded to three facilities in Union City, California, Fontana, California, and Romeoville, Illinois. With our three facilities, we are able to better serve distributors both locally and nationwide. 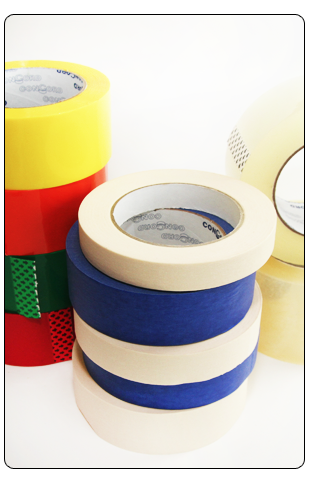 We stock over 1000 industrial tape and flexible packaging products for the convenience of our customers. We carry only premium products from the most trusted manufacturers in the business, as well as our own top quality Concord brand tapes. In 2001, we expanded our converting division with the latest technologies in fully automated slitters and converters, enabling us to further tailor our services to the needs of our customers. While helping to keep jobs local, converting allows us to lower costs, lead times, and minimum order quantities for special sizes and colors of tape. We can offer private label programs for carton sealing tapes and custom sizes for most tapes. For more information on our product line or placing an order please contact us.